It’s not much to watch – the drone takes off from the top of a parcel delivery van, flys a few hundred feet and gently deposits a small package near the front porch of a mock house in a mock neighborhood. But the demonstration Monday of the “Horsefly” delivery drone portends big things to come for the multi-billion-dollar parcel delivery business. Workhorse Group, the Ohio-based electric truck company that intends to become much more, expects the first commercial Horsefly drones to be dropping parcels on doorsteps in time for Christmas this year. 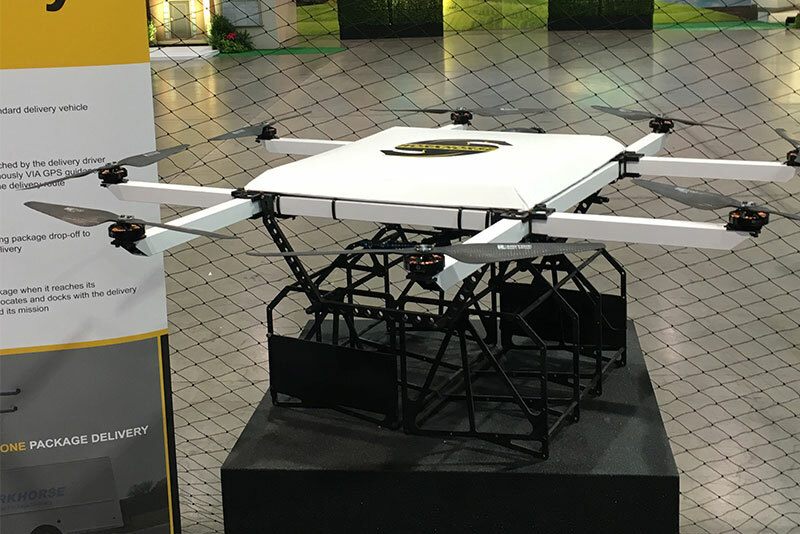 The Workhorse-designed-and-built drone – demonstrated inside a cavernous hall at the Las Vegas Convention Center during the Pack Expo international packaging trades conference – isn’t meant to make truck-based deliveries obsolete. Rather, it augments them. The drones will create quicker, easier, cheaper and safer delivery scenarios for drivers in remote rural area. Especially for hard-to-reach addresses guarded by unfriendly dogs, or blocked by snow, ice, mud or high waters, said Steve Burns, Workhorse co-founder and CEO. Since first displaying the drone as a concept in 2015, Workhorse has done significant testing. “[We’ve] done a test with UPS, we’re working with the FAA, we’ve been modifying our operational software and now we are ready,” said Burns. One of the modifications made to appease the FAA is the addition of on-board sensors to scan its surroundings while in the air. If any obstacle – tree, power pole, church steeple or even bird – is observed, the operating software now instructs the drone to alert the driver and hover in place. The driver can then park the delivery van and take over manual control of the drone. Using the battery-powered drone to drop packages along out-of-the-way routes can shave hundreds of dollars from weekly operating costs for the delivery service by cutting the amount of time a $40-per-hour driver is on the road and increasing the number of deliveries made per on shift, said Burns. The eight-rotor drone, which can fly for up to 30 minutes at speeds reaching 50 mph, costs about 3-cents per mile to operate. Depending on how often a drone delivery replaces a truck delivery, that can result in sizeable savings on fuel costs and on mileage-based truck maintenance, he said. Workhorse hasn’t released pricing information or identified any clients, although UPS is likely an early customer because it already purchases electric delivery trucks. Workhorse also is considering providing drone services directly for companies that don’t want to purchase them, he said. As a “line-of-sight” drone that operates close to its mobile base, the Horsefly clears FAA objections to the idea of unmanned, unmonitored delivery flights. The premise is that a Horsefly user such as UPS driver would launch the drone – capable of carrying a 10-pound package – from a special pad atop the delivery van. The drone then would use its internal GPS guidance system to make its way to the specified address, deposit the package near the front door and land back on the truck-top carrier. It would then be ready for reloading. The delivery driver also would be able relocate to the next address along the route. The drone is programmed to find its way back to the truck even if it has moved a considerable distance from the launch point, said Mike Dektas, Workhorse’s marketing director. FAA rules define “line of sight” as 2 miles, so the truck could move that far away, completing traditional deliveries in between drone launches, he said. The demonstrations in Las Vegas didn’t show off all of the drone’s capabilities. The demo drone was flown by a Workhorse employee with a manual remote control system because the system won’t work indoors. The obstacle avoidance system wasn’t demonstrated, either. The drone also flew only a few hundred feet each trip, rather than the hundreds of yards a real-world operation would require. But at each launch-delivery-landing sequence Monday – Workhorse is doing several a day for the three-day run of the show – a small crowd of onlookers applauded appreciatively. Dektas smiled and started looking for interested potential customers. So, you drop the package on the driveway, in plain sight? During the holiday season, when people are stealing packages off of peoples front porch that are stashed, hidden from view? What a nice informative article! Thanks!